When you have simply run out of floor space for plant stands and potted house plants it's time to think vertical. No- not hanging plants - even though that could be a solution. I'm thinking Woolly Pockets! 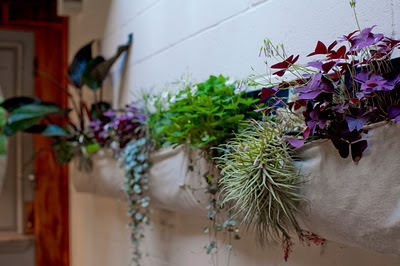 Just when you think you've seen it all - Woolly Pockets are cloth planters that can be hanged on a wall. The company also offers a plant in a purse but I am too confused by that idea to even repost. You can visit the site for a looky-loo at that. Woolly Pocket soft-sided garden containers are the ideal way to grow healthy gardens - indoors and out. Green Thumb optional. Pockets are simple to install and maintain. Just place and fill with beautiful, full-size plants. Breathable sides release excess moisture and aerate soil. Waterproof lining helps keep walls and floors dry. Woolly Pockets are handmade in the U.S.A. from recycled plastic bottles.